West Lakes and Waverley. Football and VFL Park respectively. They are 100’s of kilometers apart, yet the two are so close in many ways. They’ve even been referred to as ‘sister’ stadia. While VFL Park is long gone as a league venue, the last match for premiership points played in a previous millennia, upon entry into 2013, Football Park is too on the cusp of sharing the same fate. Next year, Footy Park will become a former league venue. Both grounds were built ‘out of town…’ VFL Park some 23 km’s from the heart of Melbourne, and Football Park 14km’s, in the much smaller city of Adelaide. Both also began with grandiose visions, the VFL’s original plans catered for 166,000 patrons and a stadium ‘equal to any in the world.’ The capacity reached the mid 70 thousands, although 92,000 did cram in on one occasion. Similarly, Football Park was designed to cater for 80,000 patrons. It too, never got close. Plans for Football Park on the left (80,000) and VFL Park (166,000). Looking quite similar! 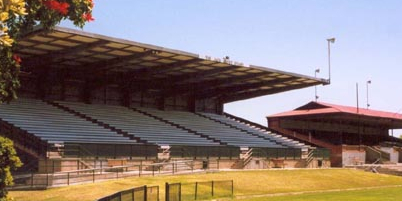 The ‘sister’ stadia shared the same basic design; concrete and bench seats all the way around, with an elevated stand opposed to ‘the outer.’ VFL Park ‘boasted’ wooden plank seats, Footy Park aluminum, a feature of many Adelaide football grounds. The plastic bucket seat has however won the day. The West Lakes oval shape is less rounded and not as expansive as Waverley Park, which could comfortably host little league matches between the fence and the boundary line. Here are the two grounds under construction, can you tell which is which? Here is what ringed (I’m referring to Football Park in a past tense I know) the outer of both grounds. Whilst Football Park is clearly smaller, both share near identical features; larger lower section, smaller ‘upper’ sheltered section with the same roofing/advertising hoardings. Here’s an aerial shot which gives a clear look at the similar set up of both stadia. Both grounds even had a gap between their stands where a small scoreboard was situated. While VFL Park boasted the notorious ‘Big V’ scoreboard, this ‘small’ one was Football Parks main board until recently. Well it’s nearly curtains for West Lakes, both it and Waverley conquered by the very cricket grounds they sought to replace. But they have played their roles admirably, and football now resides at the MCG and Adelaide Oval (as of 2014) in a more powerful position. I hope the South Australian footy people can send the old girl off in style. Ugly as she was, she had character. And in a final twist of synchronisation, Football Park will join Waverley in becoming both a housing estate and elite AFL training venue…..together forever. This entry was posted in Home & Away, Musings and tagged AAM Stadium, Adelaide, Adelaide Crows, Adelaide Oval, afl, Aluminum, Arctic Park, Football Park, Footy, Footy Park, Port Adelaide Power, SANFL, suburbs, VFL, VFL Park, Waverley park, West Lakes by theholyboot. Bookmark the permalink. ‘Together forever’ indeed, Holy Boot.Will the streets of the Westlakes housing estate be named after famous stadiums, like the streets of the Waverley Park housing estate. Or will there be Weidmemann Way and Williams Boulevard and Wanganeen Avenue and Kane Cornes Crescent? Here’s hoping someone salvages the scoreboard. Footy Park has been “League Headquarters” to a generation of South Aussie footy fans, myself included (well to those of us who follow the SANFL more than we do the glorified VFL). I love the Adelaide Oval but I have to admit I’m going to miss West Lakes.